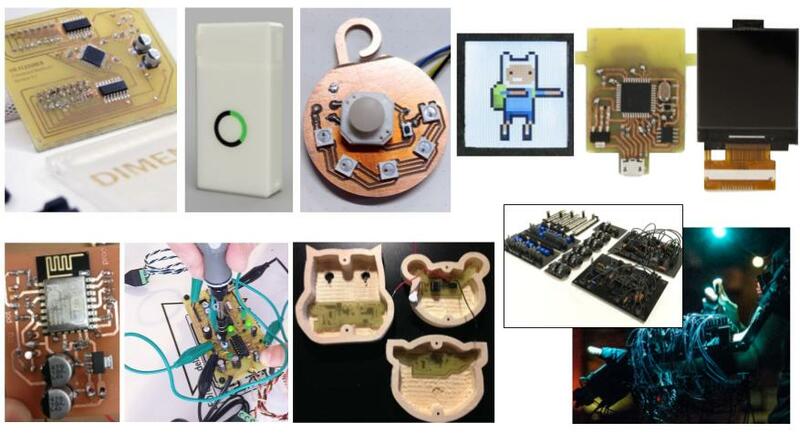 I’ve been teaching graduate students at NYU’s ITP program since 2015 as an adjunct professor, teaching a course of my own making title Homemade Hardware (link to my class website). There, student learn to design and fabricate do-it-yourself PCBs, all without leaving the school. To make a working PCB for a physical computing project, a variety of new skills must be learned relatively quickly in a semester. From electronics basics, to CAD design, and milling machines, it definitely true that hardware is hard, but in the end is most rewarding. We start the semester off taking ITP’s most common circuit board, the Arduino Uno, and breaking it down to it’s most simple form (just the micro on a breadboard). We then take an indepth look at how a piece of code is placed onto the micro, so that now the students no longer need an actual Arduino to make their projects. Then, there’s a quick review of electronics basics, just the bare minimum so they can make simple digital circuits. With this new knowledge in place, they get their hands dirty soldering through-hole PCBs, and populating their first surface-mount PCB. 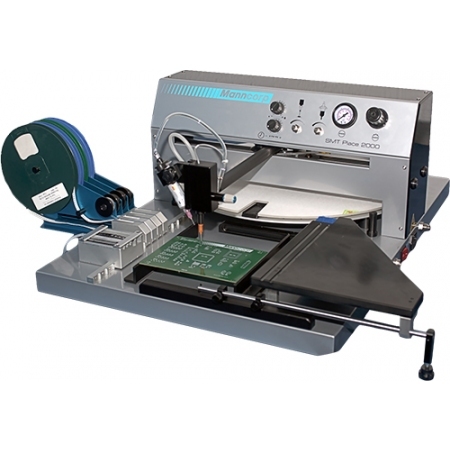 ITP has a nice reflow oven, set of heat guns, and the most amazing manual pick-and-place machine (pictured below). 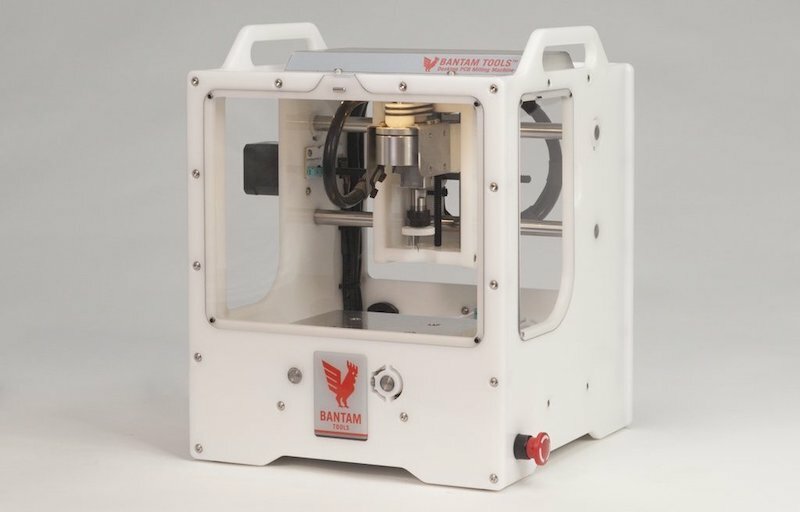 Then it’s off to the fun stuff, design with Eagle CAD and micro-milling with Bantam Tools’ Desktop PCB Milling Machine. This is where they can start putting their ideas down into board designs, and quickly milling them to test and try out. The desktop PCB milling machine is was the original game-changer that kickstarted this class, and it’s great to see it doing well and continuing to improve. The final weeks of the class, I shift to acid etching PCBs using muriatic acid, and a laser-cutter to remove the acid-blocking ink (this is to replace the older toner-transfer method). While acid etching combined with micro-milling yields the best PCB quality, only a handful of students in the past have chosen acid etching, probably because the process is long and more prone to mistakes. During my master’s thesis at ITP, I thought that homemade PCBs would spur some kind of maker revolution, similar to 3d printing. Now I’m not as pie-in-the-sky as I was then (like some 3d printing evangelicals from years past may also feel), but I do think homemade PCBs are a welcome addition to the maker processes. And perhaps it will continue to get easier and easier. I’ve learned that the short-term benefits to students are that they are able to build ITP projects that do not fall apart easily (this is most noticable when my students perform at the NIME concert and their piece does not break). Also, they are better able to build a polished look and size for their hardware projects during thesis and in their portfolio. In the long-term, students have been able to move on and work with electronics professionally, just as I did. Making DIY PCBs is not a normal way of learning electronics, but I think it is a strength because once they move on to professionally made PCBs, it seems so much easier that it’s not intimidating any more.